Reaktor running in Logic 6.1 and in Cubase SX — functionality and performance is almost identical.Although Steinberg resolutely cling to the VST protocol and Emagic continue to champion Audio Units, the boundaries are becoming increasingly blurred. Two months is a long time in the heady world of plug-in development, and since Mark Wherry's look at FXpansion's VST wrapper for Audio Units hosts (available from www.fxpansion.com), there have been a number of significant software releases. 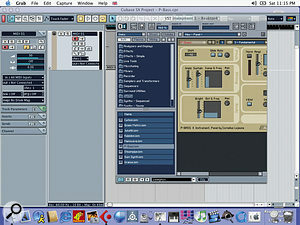 Native Instruments now have several virtual instruments that can work as VST plug-ins (in OS 9 and OS X) and as Audio Units plug-ins in OS X, as well as in stand-alone mode, while Waves, who make the Native Power Pack suite of industry-standard plug-ins, have a beta version of the Audio Unit WaveShell to add to the VST and DAE shells already available for OS X. For those who haven't used Waves plug-ins, the WaveShell is the item that is placed in the relevant plug-ins folder. The plug-ins themselves can be stored anywhere, since it is the WaveShell that acts as an intermediary between the host application and this location. 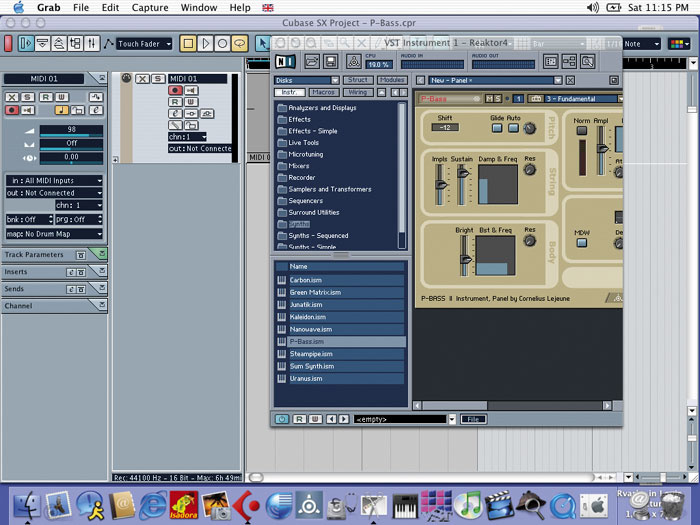 Waves' plug-ins have been available for OS X for some time, while the various WaveShells required to allow each type of host to see the plug-ins have been developed at different speeds. This month, then, I decided to check out the relative performance and operation of the Audio Units and VST versions of Reaktor 4 from Native Instruments, as well as the Waves suite of plug-ins. 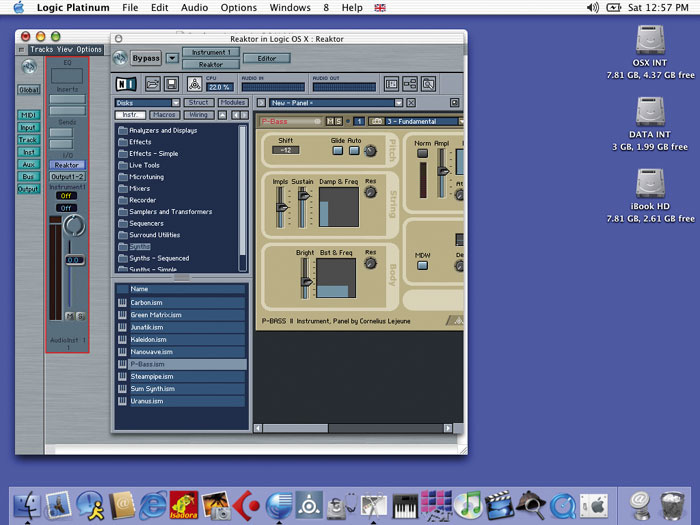 Once I had downloaded the upgrade to version 4.0.1, Reaktor had no problems running as either an Audio Units plug-in in Logic 6.1 or a VST plug-in in Cubase SX, and CPU load appeared to be very similar (see screenshots). Functionality seems unaffected by the choice of platform — but still neither version allows the resizing of the plug-in edit window, something of an issue with a virtual instrument as potentially complex as Reaktor. Although it is usually placed in the correct location by the install routine, I was obliged to manually install the Audio Units WaveShell (as it is currently not included in the Waves package). This was a reminder for me of how OS X looks after such things as plug-ins, no longer allowing them to reside in the Application folder. Audio Units plug-ins reside in the root-level Library (as opposed to the Library in the Home directory), in Library / Audio /Plug­ins/Components, and hence are available to all compatible applications. The Waves Audio Units WaveShell I tested was a pre-release beta numbered version 1.0b5, and it has to be said that I did experience some instability with it, but this is more than likely due to the relative unsuitability of the test system, an iBook 600MHz with 384MB of RAM. The iBook range is rumoured to be nearing the end of its current incarnation (even eMacs have G4 processors), and this machine with OS X loaded does not respond as snappily as it does in OS 9. However, the main issue appears to be lack of memory. Attempting to start Logic 6.1 with the WaveShell in place caused the application to quit on loading, at which point I contacted Emagic's technical support line at their UK distributor Sound Technology. Before I could mention the WaveShell, they identified lack of memory as the cause of the problem. I had not been expecting this, since Reaktor had not caused any such hassles. Emagic's recommendation as a bare minimum for OS X and Logic is 512MB, with 1GB being more comfortable. The 384MB in my iBook was considered ample when the machine was purchased back in November 2001, but with this information and the increasing hunger for memory of all applications and plug-ins I may have to 'demote' it back to OS 9 (though buying more memory might grant a temporary stay of execution). Long may Emagic release parallel updates for both operating systems! Following the advice from the tech support line, I removed all components from the plug-in folder except that for the WaveShell, and this allowed Logic to load, lending some weight to the memory theory. Each new component increased the size of memory partition required by the application. It would appear, then, that the Waves WaveShell requires a lot more memory than most, perhaps due to the way in which it acts as an intermediate layer between the host applications and the plug-ins themselves. However, I got it to work, and the accompanying screenshot showing these industry-standard plug-ins open in an Audio Units host does represent quite a moment for me and those others who have been following the development of this new format (note to self: get out more!). Logic users will find that performance is very similar in OS X to what it is in OS 9. I was able to load four stereo Waves RVerbs (RVerb is a notorious CPU hog) before Logic gave up (as the fifth was loaded) on both platforms. Cubase SX would only load three of the VST version, whereupon it suffered from the 'crackling' that I have previously noted plagues CPU-hungry Waves plug-ins on this host. I would be prepared to accept that this might be the product of running such plug-ins on my lowly iBook (see above) but I have also experienced the same problem on some recent PowerMacs. It should be remembered that the WaveShell on test is still a beta version, and that this problem may be ironed out in the full release. I should also note that Cubase SX had no problem loading with a full complement of components in place, but did not run smoothly, continuing the Cubase tradition which slows all operations when the processor is under stress, something that does not seem to affect Logic in the same way. (A time-limited demo version of the Waves plug-in suite, currently for VST and DAE hosts only, is available from www.waves.com). Peering back in time to those sepia-tinted days when everyone used OS 9 (what do you mean, some still are?! ), if a program began to misbehave, an easy solution was often to trash the preference file. These were easily found in the Preferences folder inside the System folder. Logic, especially, seemed to benefit from this process, and preference trashing became a routine housekeeping operation. However, during the early days of OS X, we were led to believe that it would become unnecessary, as the stability of OS X's UNIX core would make such drudgery a thing of the past. Those of us who enjoy tinkering under the bonnet will be glad to hear that preferences are alive and well, and living in a more exotic location, the full path name for which is Your System Drive / Users / Your Username / Library / Preferences. This is more easily accessed by clicking on the Home icon at the top of any window (which takes you to the Home folder that bears your Username), then choosing Library / Preferences. Logic's preferences are called 'info.emagic.logic', while the files for Cubase SX can be found within a folder bearing that name. Crashing programs in OS X report the nature of the crash in a log file that can then be sent to the relevant developer for inspection. These get stored in the following location: Home Folder / Library / Logs / Crash Reporter. They will be named something like 'Logic.crash.log' (in the case of Logic). The cut and thrust of development almost bit back as Apple announced iTunes 4 to coincide with the launch of the Apple Music Store in the US. The first version of iTunes 4 allowed file sharing across the Internet, and almost overnight sites such as iSuck (http://isuck.h3q.com/cgi-bin/isuck_search.pl) sprang up to create a Napster-like 'community' threatening to undermine the legitimacy of the Apple Music Store. Apple responded quickly with a minor update, to 4.0.1 that removed this feature, but be warned, without the update your machine may be at the mercy of surfers cruising the net for free music. This update also fixes the poor iTunes sound quality suffered by a small number of machines, so it's highly recommended. The new iPod launched at the same time is slimmer and lighter than its predecessor, with capacities of 10GB, 15GB and 30GB available, and is certain to remain Apple's top seller. Having read the blurb at www.apple.com/uk/ipod/ and been suitably impressed when given a brief demo at the recent UK Press launch, I was keen to put one through its paces. I managed to get hold of a 15GB version, which, like its 30GB sibling, comes with the ultra­natty desktop dock that doubles as both a FireWire connector and a power supply. Fifteen and 30GB models also come with a carrying case and wired remote to tempt you to spend the extra cash. The new iPods (and iTunes 4) support AAC (MPEG4) encoding, so I compared the time taken to convert an audio CD into this format with MP3 encoding. Both formats took around 10 minutes to convert the 42 minutes (430MB) of Joni Mitchell's The Hissing of Summer Lawns. The 39MB of compressed data (with both formats set to 128KB/s) transferred to the iPod in less than five seconds (equating to an approximate data transfer rate of around 10MB/s)! Comparing quality, however, revealed the AAC format to be clearly superior at equal bit rates. The iPod is also able to function as a FireWire hard drive (which in essence is just what it is), with your music collection staying invisible to the Finder. This new iPod ran 37 tracks of continuous 16-bit, 44.1kHz audio in Logic 6.1 (with the Larger Disk Buffer option enabled) which is a small improvement on its predecessor's 32 tracks (on the same iBook 600). Apple are claiming a big success in the States for their Music Store, with one million songs downloaded in the first week of operation, and two million after 16 days, with a surprising proportion being whole album purchases. From a customer base of about 2.5 million Mac OS X users, not all of whom have broadband, these are quite some numbers, and Apple Europe have optimistically suggested we could have the store over here by late summer. Of course, that relies on licensing agreements from the big record labels. I'll be interested to see how quickly material from some of the esoteric 'independent' labels (also difficult to get hold of in high street record stores) will become available. 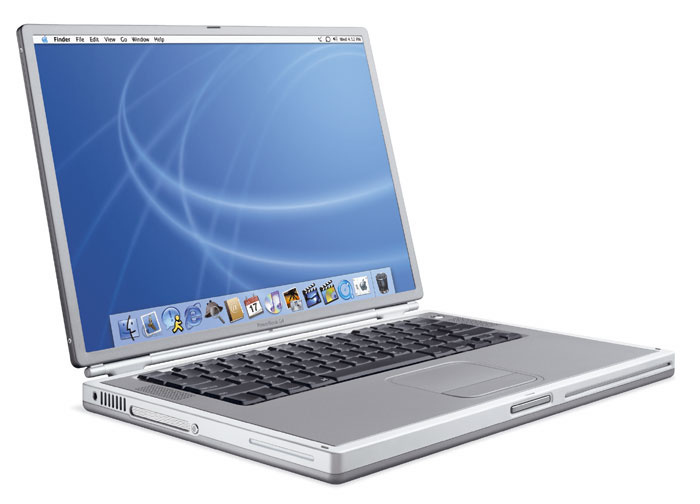 Apple have reduced the price of four out the five models in the Powerbook range. The 1GHz Superdrive 15-inch TiBook is down £200 from £2199 to £1999, and the 867MHz DVD/CD-RW 15-inch TiBook is down £300 from £1899 to £1599. Cynics who witnessed a price reduction in the iBook range just before Christmas, followed shortly thereafter by a speed bump to the entire range, might see this as a sign that the TiBooks are about to be replaced by aluminium-cased versions, to match the newer models. To counter this speculation, following their last speed bumps the 15-inch Titanium Powerbooks have remained competitive in most aspects with the 12-inch and 17-inch versions, the lack of AirPort Extreme and FireWire 800 being the only dips in an otherwise smooth progression through the range. Moreover, Apple have also reduced the price of both 12-inch Powerbooks (867MHz DVD/CD-RW) and 867MHz SuperDrive) by £100, lending credence to their support for laptops as a viable alternative to desktops. A significant 42 percent of Apple sales last quarter were laptops, and this price reduction may just be part of a continued sales push now that 'early adopters' have purchased their machines.